Valid on in-stock merchandise only shipping to a single U.S. address. Excludes shipping to Puerto Rico, Alaska and Hawaii and shipping on returned merchandise. Shipping weight calculated in cart (billable weight) may differ from the actual weight of the item. Large or heavy items may include an oversized handling fee. Burlington reserves the right to change and/or withdraw this offer without prior notification. 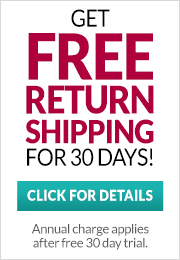 Returning your online order to a store is easy! Bring your shipment confirmation email to a store near you. A store associate will scan the shipment confirmation email. The items that are returned will be refunded to the original method of payment (excluding Paypal).